I purchased an ice cream maker several years ago when a business associate gave me a gift certificate for cooking.com. It sits, largely neglected, glaring at me from the top of my refrigerator. But once a year I bring it down to make this treat. Many sorbet recipes call for an equal ratio of water to sugar. I find this far too sweet. There are also sorbet recipes that call for beaten egg whites, which, while providing a smoother consistency, is unnecessary. This lemon sorbet is just slightly sweet and a bit tart, the basil adding a taste of spring and summer; perfect for a hot day. 1. Put the lemon peel, water, and two of the basil leaves into a saucepan. Bring the water to boil, and then add the sugar, stirring to dissolve. Simmer for two minutes more until the mixture is the consistency of a thin syrup. 2. Remove the pot from the heat, and strain the water into a bowl, discarding the basil leaves and lemon peel. 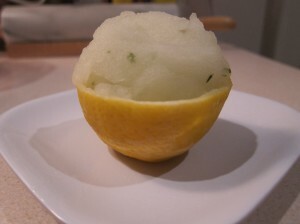 Let cool 30 minutes, and then place in the refrigerator for at least two hours, or until ready to make the sorbet. 3. Stir in 3/4 of the cup of lemon juice to the mixture and taste. If it is is not tart enough, add the remaining 1/4 cup. 4. Place the mixture in your ice cream maker and process according to the manufacturer’s directions. 6. At this point the sorbet may still be a little soft. If this is the case, scoop it into a container and freeze for 30 minutes or until ready to serve. © 2010, taetopia. All rights reserved. This entry was posted on Saturday, May 8th, 2010 at 10:32 am	and is filed under Recipes. You can follow any responses to this entry through the RSS 2.0 feed. You can leave a response, or trackback from your own site. Really interesting flavor combo – lemon and basil sound delicious together and totally refreshing! I’ve had basil ice cream at Out The Door in SF. I was skeptical at first, but then I couldn’t get enough. Thanks for sharing! © Tae Ellin and taetopia.com, 2010. Unauthorized use and/or duplication of this material without express and written permission from this blog’s author and/or owner is strictly prohibited. Excerpts and links may be used, provided that full and clear credit is given to Tae Ellin and taetopia.com, with appropriate and specific direction to the original content.